Clouds gather over Avon on Friday, June 20. The weekend forecast for Avon calls for a 20 percent chance of thunderstorms Saturday and 30 percent chance Sunday. 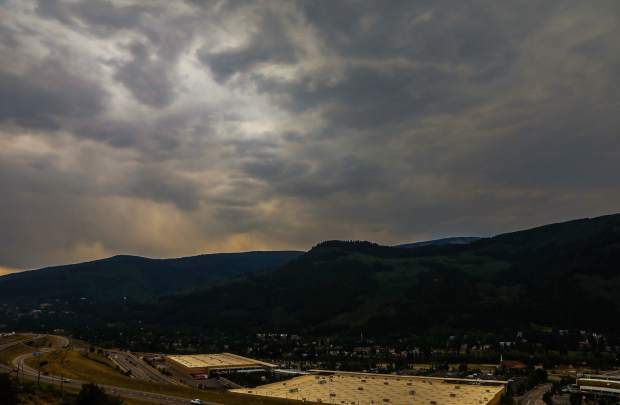 SUMMIT COUNTY — Anglers, firefighters, residents and tourists alike have been looking to the skies for the past few weeks, hoping to see signs of the predicted wetter-than-average North American monsoon season. While the rains have not quite kicked off yet, climate experts are still predicting a wet few months that will hopefully put a dent in the drought being felt statewide. From July through September, intense solar heat raises surface temperatures across the southwest. Hot air rises due to low density and leaves behind areas of low pressure called thermal lows. Winds usually push air from high pressure systems to low pressure systems; this is how moist air from the Gulf of Mexico is pulled into the low-pressure area in and around the Mojave desert. When that moist air hits the western slopes of the Rockies, it tries to travel up and over the mountains. However, once it hits a certain altitude, the moist air cools and condenses, forming rainclouds and thunderstorms that drop lots of water on the high country nearly every day during late summer. Peter Goble, a climatologist for Colorado State University’s Colorado Climate Center, said mountain valley areas such as Summit and Eagle counties are especially prone to monsoon rains because of the way mountain peaks essentially act as thunderstorm attractors. Goble added that while those rains are very much welcome across Colorado after a dry winter, there are some significant dangers that people should be wary of. Flash floods are a common concern in the high country during the rainy season, as thin, dry mountain soil is often unable to absorb all the water from sudden downpours. The water washes across the surface and collects into gullies and streams within hours or even minutes, and before you know it, there is a wall of water rushing through areas that were bone dry minutes before. There’s an extra danger for people hiking or climbing near mountain peaks. Aside from the additional risk of being struck by lightning, torrential rainfall and flooding can strand people traveling near the top. Goble said the National Oceanic and Atmospheric Administration’s Climate Prediction Center is still forecasting a strong monsoon season from late July into October, inviting a welcome calm after a very angry wildfire season.